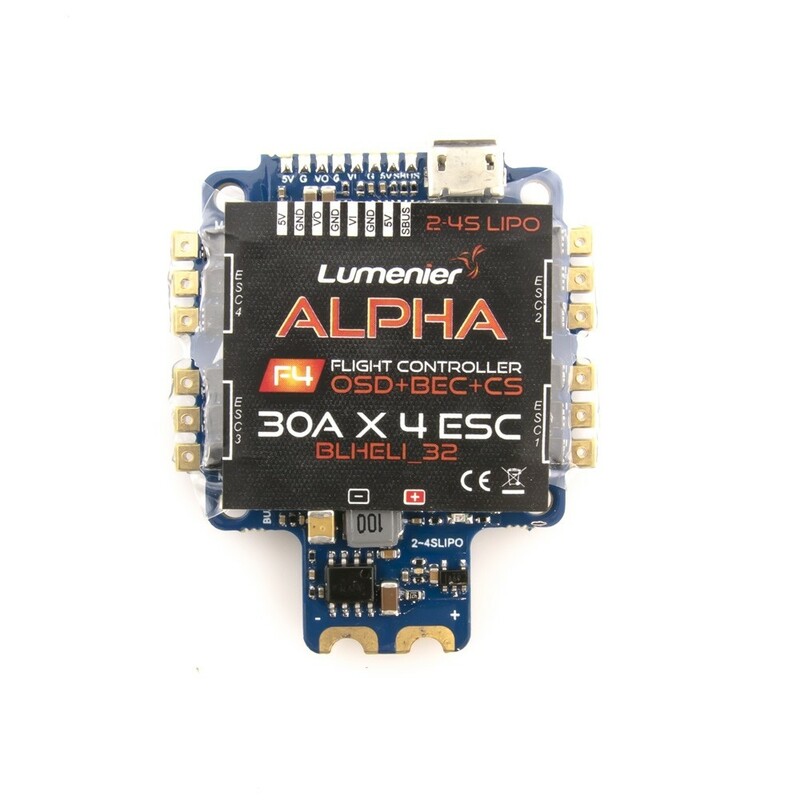 Lumenier released ALPHA AIO Flight Controller after the sucessful Lumenier F4 AIO FC. 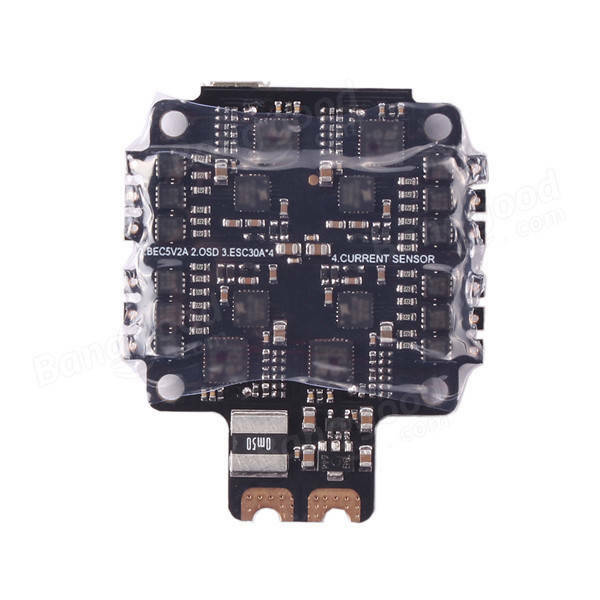 It is F4 FC, 4in1 30A BLHeli_32 bit ESCs, Betaflight OSD, PDB, 5v 3A BEC and Current Sensor on one board and with total weight only 16g. 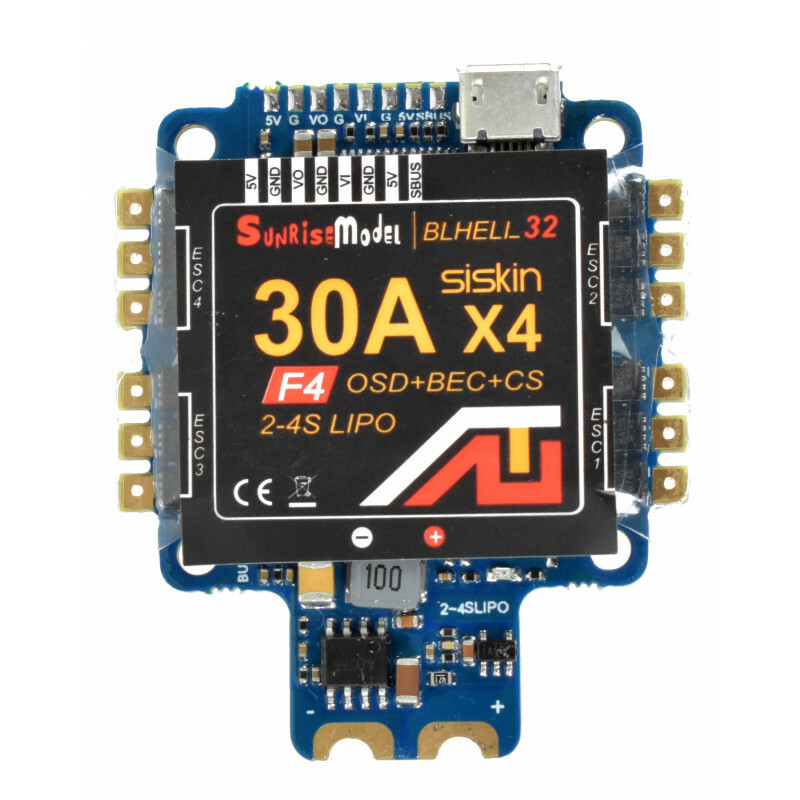 Together with FC you’ll find the newest state of the art 30A BLHELI_32 ESC’s that can be configured or firmware updated via betaflight configurator. 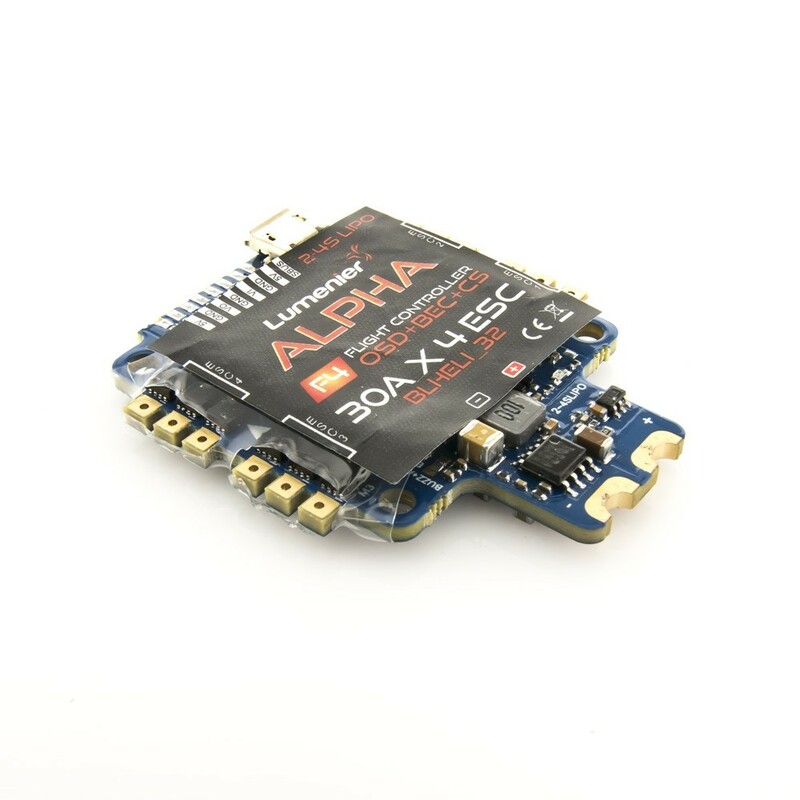 Some things that this AIO FC is missing: microSD card slot for BlackBox (but there is some unknown size flash chip for it) and additional UART pads for telemetry and SmartAudio output. Maybe they are under the heatshrink…? Update 2017-09-27: Yes, additional UART pads (TX,RX) are under the heatshrink. Also I think there are Buzzer pads also. Update (2017-10-20): Actually Lumenier ALPHA AIO and Racerstar TattoF4 AIO appears to be just rebranded Sunrise Siskin BLHeli_32 30A AIO FC. This FC looks interesting, but the deal killer for me is that they only expose one UART (SBUS, probably UART1). Not being able to hook up s.port or SmartAudio is a bummer. It’s priced OK, considering it’s a BLHELI_32 ESC and Omnibus F4 FC. LOL – It’s not even listed on the Lumenier site. 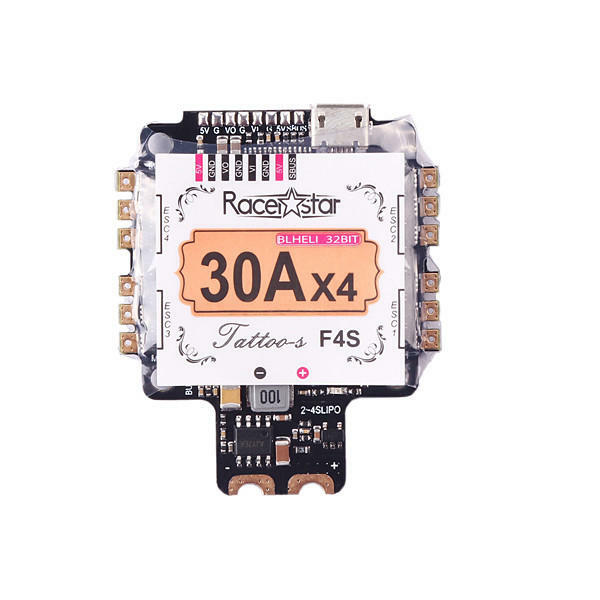 I don’t know what happened to them, the LUX controllers were supported pretty well, but the “successful” F4 AIO got zero support from Lumenier or GetFPV, so not optimistic we’ll ever see any docs or anything for this board. Thanks for your thoughts! As always you are on spot. When I contacted GetFPV with questions about Lumenier F4 AIO board, I’ve got an answer to use common sense and to look at other FC’s as example. No manual, no documentation. At least connection diagram was present. And at least I’ve got a reply :). As for ALPHA FC – indeed, no way to hook up the SPort and SmartAudio. Maybe there is some spot under the heatshrink? I’ll ask the GetFPV. I also guess there are pads for buzzer under that label. You can reappoint LED to be an additional UART in Betaflight 3.2 so 3 UART use is possible. I am attempting to reappoint the LED to UART. Can you tell me if I solder to the LED pad and then what CLI commands in Betaflight? I am using the TX6 pad for VTX control. Need this extra UART for Telemetry to my R-XSR Rx. Got it working by soldering to the P pad, but need the extra Uart for both Telemetry & VTX control. Thanks. Does VI and VO stand for video in and video out, respectively? Yes, definitely. You can also use +5V and GND pads for your camera alog with the VIn pad. Could you please add a photo of the UART pads that are under the heat shrink wrapper? I will be tearing mine off soon, flying it at the moment with the wrapping on… I am planning to set this board up with a Runcam Split 2 on a Dquad Obsession V2. I am assuming that the 5V and Grnd I need to use for this camera board are at the front of the ALPHA board looking down at the left top, for the camera Power,(I have no idea if it is a 1A 5v OUTPUT OR IF IT IS FILTERED to some mah rating) but the RX and TX are in the middle of the board under the wrapper…are they labeled? 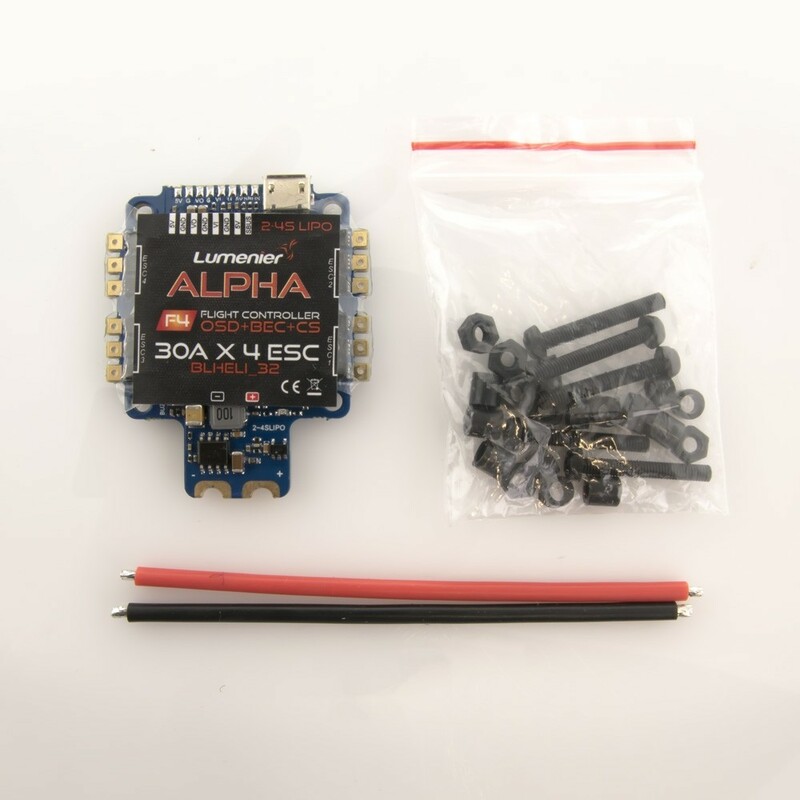 I don’t have a VTX yet, and am going to use it as a dash cam to record flights while I LOS fly, so I probably shouldn’t solder Video signal in with no place for the signal to go (does it matter? ), I will just hook up power & Ground and RX/TX for betaflight control. Lumenier said they would provide documentation for the ALPHA AIO, but nothing has been created or offered so far…thanks for the early review. I am waiting excitedly for a more in-depth video review with more details on this board to learn more about it…there was no documentation provided with the product as it was sold on GetFPV, just the board in a plastic static free bag packed in a box with some free props I will never use. I am at a loss as to use the 5V and Grnd for a Future VTX and just run the Camera from the Battery directly, since the Split 2 can take up to 17v DC input while accounting for voltage spikes. 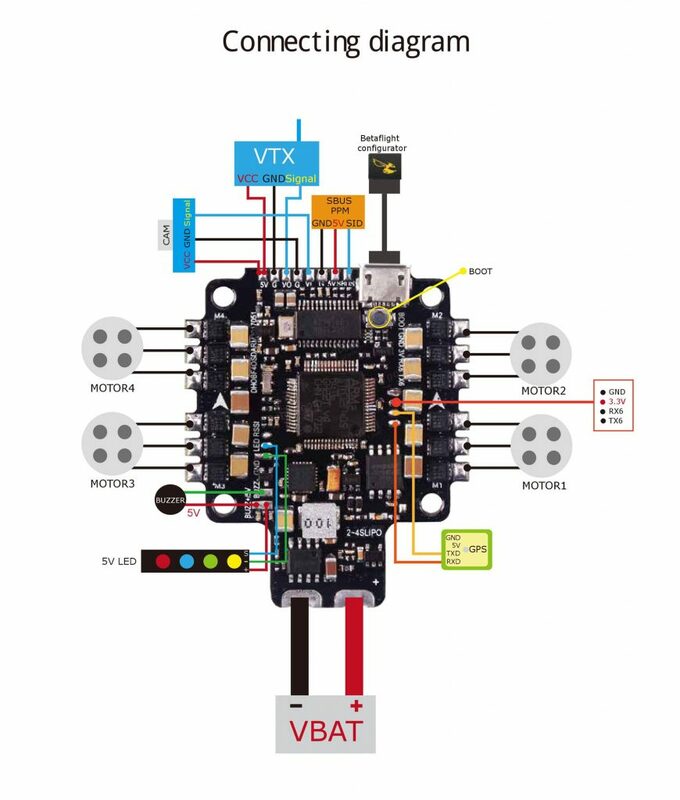 Or run the VTX from a higher voltage source…Planning on using the TBS Unify Pro HV, that can also run off the 4S battery directly if need be. Does this sound reasonable? This FC is actually rebranded Sunrise Siskin AIO. I have added the connection diagram to the article. 5V out is about 2A, should be sufficient for Cam. I suggest to power the FPV cam via +5V. BUT if you will use RunCam Split 2 then there is a note on the RunCam website: “… 17V input power support (v1 only supported 5V). So you can comfortably power the v2 split with a 4S battery and not worry about voltage spikes.“. So perhaps direct power from battery is a better idea for RunCam Split 2. General rule – if you have (or dont want to have) interference on your video feed – try to connect power for video devices as closed to the battery as possible. Somewhere between battery and ESC’s. Thanks for the Update…and the direct reply…Greatly appreciated! Pros EASY install & yes i was looking to see where i hooked up my s.port but with Beta Telemetry is all there Voltage and all … 19 solder points and you are done under 4 hours build is possible with some knowledge 2 hours max! Power using 5v for the Frsky receiver from the board and next to it is Sbus & ground. for my video im going directly under the main power lead so “direct” the Tramp has all the filters and for the icing a cap for those ripms … next is Video camera OUT wire from the camera to VIDEO IN, VIDEO OUT to VTX or Tramp. connect the provided cable from Tramp to camera. Connect Receiver ADD power BIND receiver.- Route antenna cables and Vtx antenna DONE. Cons: 1. i rotated the board -90 and had to use the Resource on CLI to re-map all motors, is not that hard but is a pain to get right the first time, the board docent provide power to the receiver while on USB,,, what a letdown 2, the wire provided for the power hookup is thin real thin, also the spacing is not to standard XT60 it smaller! so lets say … looks like it will fit nice and flush but o no you cant have that. other than if you run the board on the intended way the power lead to the back, the USB in now towards the front its almost not possible to fit a USB cable The Camera is front of IT! LOL my struggle is real. Big thing on BL32 you need a stand alone program from them it wont do a pass-trough on BLHeli. So far my little beast is a bit vibefabulous so i will report back. Thanks for your report and valuable information! Nice setup! All of the latest tech. Anyone been able to get the D’shot commands to work with this setup? Supposedly all blheli 32 works but so far I can’t get esc beeper or turtle mode to work. Running blheli32 32.2.0.1 and betaflight 3.2.1. I haven’t tested the beeper but I turtle mode works fine. Make sure you have it bound to something and then when your quad is upside down, disarm, hit turtle mode switch, arm switch and you should be able to flip (assuming nothing is stopping the props on one side). Just installed the Lumenier version of this tonight and so far so good. Couple of problems I had were worked out after a little trial and error. Motor 3 wouldn’t spin and then the ESC would beep a couple of times and the motor would start a stuttering of on-off-on-off until the battery was disconnected. After figuring out I needed the BLHeli32 software and not the Chrome plugin version, I flashed the ESCs but that didn’t help. I then calibrated them and that did the trick. I had a hard time getting my receiver to work but I finally got it going. Thought I was going to have to use RX6 but eventually worked it out and got sbus working where it was supposed to. Tomorrow will be the maiden flight. so has anyone figured out s port???? Flashed ESC’s with new BL32.3.0 Flashed BT 3.2.1 again, made all construction free of any wire rubbing running the bolts just light tight… and the big one on BL32 went from 24pwm to 48pwm that seems to almost got her done… final flight tomorrow sun’s taking a brake and night is here… thats 8k & 4k havent tried 32k and i dont think it will do it. FYI…On the Sunrise Siskin, the Racerstar, as well as the ALPHA…be careful with the USB port when you connect it because it can easily break the solder welds that hold it to the board; seems like they used a light duty solder as a mechanical weld when they should have used a heavy duty solder to hold the USB in place. Many are finding out the hard way that they need to pay attention to it and re-solder the USB Down, when it gets loose. If you put one on a Dquad Obsession or any Sub 210 frame you will have to remove the pod or cage to update the FC, Because the USB is right next to a standoff. GRRRR! Other boards have it under the VBAT pads, or in the middle of the board. The positive is this board Fly’s beautifully and runs even smoother with a 1000uF or 2000uF 25V Capacitor on the VBAT terminals! Thanks for your remarks, now we have the place with the most complete information on this board! I got Telemetry running in FrSKY R-XSR! I am running a wire from my P pad (uninverted in) on my R-XSR to the TX6 pad (Uninverted out) on the ALPHA AIO, Then in betaflight, set it UART 6 to SPort and discover sensors on your FrSKY TX…it was that easy…only hard thing is the TINY solder pad on the R-XSR. What did you do with the smart port wire on the connector? You should use LUXF4OSD target for flasing in BF 3.2. If you get the error: “No response from the bootloader, programming failed” then you need special drivers for DFU mode (search for “Zadig drivers”). Figured it out: SBUS port on these boards (and most F4 boards?) has a hardware inverter for use with FrSky rx’s. Spektrum rx’s will not work if soldered direct to the SBUS pad. Must bypass the inverter by soldering to the bottom prong of the inverter, which is the black circuit with two prongs on the top, and one on the bottom, located just south of the bootloader button. Soldered to the bottom prong, and it’s now working as expected. Do u have a pic of the inverter prong u soddered it to? Does this FC run Dshot 1200? If not, what protocol does it use? 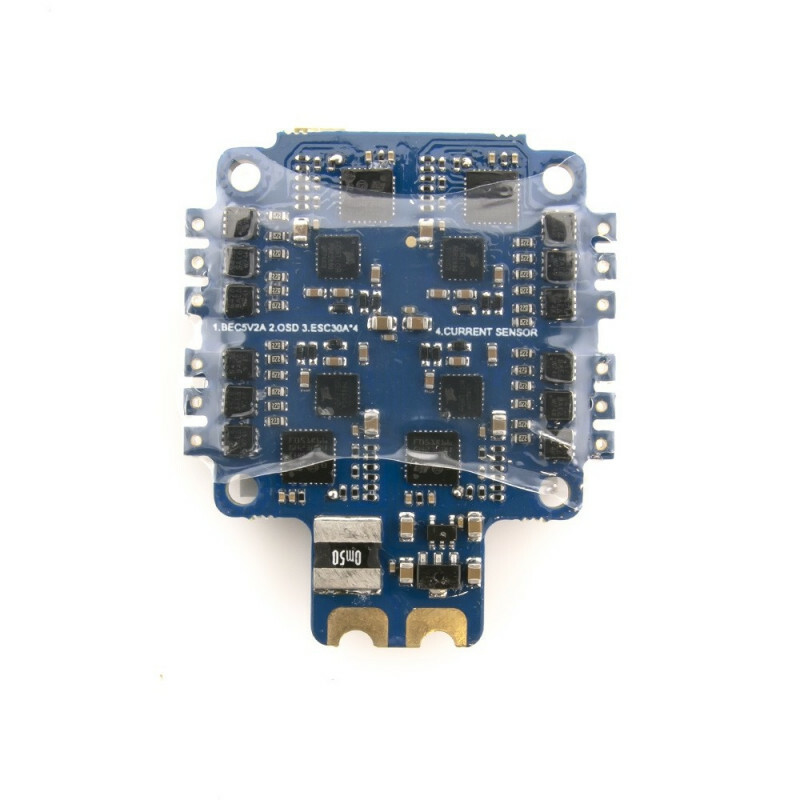 As it has BLheli_32 ESC’s, it should support Oneshot 42 & 125, Muti-shot, Dshot 300, 600, and Dshot 1200. You should look for ESC protocol selection dropbox in the BF configurator. I can’t get my spektrum receiver to work no matter what I do. I’ve tried multiple receivers, they all work om other builds, I’ve tried 3 different uart ports, have it powdered externally, soldered to the inverter, nothing. This is so frustrating. Ok, so I actually had a faulty board. Replaced the board and still couldn’t get the Sbus port working with my spektrum receiver (yes I had 3.3v even had externally powered because i read above that reveiver wont get power while usb is plugged in, also tried turning inversion off and then manually bypassing as described by AJ), but uart port 6 worked perfectly. Uart port 6 also bypasses the inverter, so you don’t have to worry about any of that nonsense, just solder on receiver and away you go, gets power while usb is plugged in, too. I have the board on soft standoffs and emax RS2205s motors on TPU softmounts. Default PIDs were amazing. Motors were coming in hot so I dropped D a touch, but otherwise incredibly smooth on 8/4 loop, Dshot600, I’ll bump it up eventually but for the moment it’s flying better than anything I’ve ever tuned. 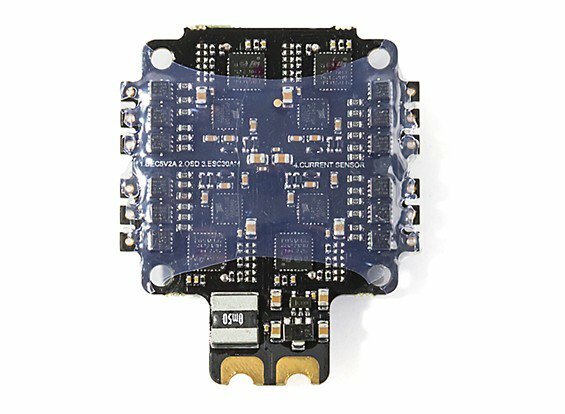 I am having a problem with this board the lumenier version where when i arm and give slight throttle the quad goes full throttle and shoots up until i disarm. Motors come back extremely hot any ideas? Updated the fc to latest software and now the fr sky reciever will recognize in configuration and when I set uart 1 to frsky and save it refuses to save. Any ideas would be huge at this point. Thanks, Scott, for the heads-up! This is indeed the best price Sunrise/Lumenier/Racerstar/Multistar AIO board so far. So I did the reflash to LUXf4OSD. and when I connect a battery the motors just starts spinning. That I somewhat scary so I flashed it back to the Original BF. Can anyone help with what might have caused this? or Betaflight you can set up Multishot and calibrate motors that way, but if running Dshot may not be necessary. It says PPM but I can’t get it to connect with PPM. So I put a Frsky XM+ and SBUS then it worked. Any Workaround to get PPM to work? Found another version of this board! seems like everyone has a version of this! Yes, that is just another re-branded version of this board. I am having a hard time with one motor misbehaving with this board. On motor sounds completely different than the rest, has sort of a ratchet sound to it instead of being smooth sounding like others. That motor would dip badly during throttle punches and oscillates a lot. Thought the motor was bad so I swapped it with new one, and it has the same problem. Flashed latest betaflight and blheli32 with no effect. Also noticed that when arming at min idle that motor visibly spins slower than the others, like 1/3 less. Not sure what else to do. Its flyable, but not smooth by any means. Its as if the FC is fighting with that motor to keep up with the others. Could it be a bad board, or bad ESC? I can confirm that this AIO has a built in Dataflash storage, and I have downloaded the logs via Betaflight 3.4 from it and viewed it in Black Box Log viewer! It works great…I don’t know how many full 3min flights you can review before it ovewrites the flash memory but I have more than 40 instances of plugging in and shutting off my FC during set up and tuning (all short timeframes) along with about 4 full flights that I can review. It definitely helped me troubleshoot a bad yaw twitch on a new build with this board and BF 3.4 defaults, that had me shutting off D-term boost, while enableing Dyanic filtering and changing to 8K*8K and reducing my D Term setpoint slightly. Additionally the board shipped with the ESC’s unsynchronized, had to use BL_Heli_32 to synchronize my motors, as it twitched badly out of the package, BL_Heli Music editor also works with this board also….buyer beware, always update your ESC’s in BL_Heli 32, and then tune it in BF 3.4, 8K*8K is recommended, and Dynamic filtering will only make it slightly more buttery smooth, but if you soft mount with new motors, you may even not need it. Thanks for your feedback! Great info. BTW: never heared about BLHeli_32 synchronization. What do you mean by that? How is it done? Because you can use BL_Heli motor beeps and tones, and Music from BLHeli’s Music Editor, the Buzzer pad can be reallocated in BF to function as an additional UART such as Smart Audio. Turtle mode also is confirmed to work with the LuxF4osd target in BF 3.4 I will get back to synchronizing in BL_Heli..its not hard, but honestly they should all come pre synchronized from the factory, I am hoping my board was a rare exception…will find out when I plug the second ALPHA board I have in to BLHeli_32 to check. Oh its needed for motor sounds. Now I got it. Never bothered to play with motor sounds. Thanks for your reply. I think its possible to use an additional UART directly on the MainChip witch is not routed out. Anyone have a BLHeli_32 Target for this board? I dont think I flashed the correct one. Some Issues with my last 4 AIO boards of this model…1.) The SMD mount Caps pop off EASY…2.) the Gyro starts to drift after about 30 packs…3.) the USB cant be used in a tight build to tune…4.) 2 out of 5 boards stopped working after plugging in to BF, just DEAD. I think I have given this platform more money than my old high maintenance girlfriend…I am over it. Looking for a solid F4 FC with a 4in1 ESC that is known to be solid. I’m also looking for suggestions.